On day 9 of 16 days for youth we visited the cute kids at Vrolike Vinkies in Malmesbury. The ECD, which is well known in the town, has laid the foundation for children from different backgrounds over the last few decades. 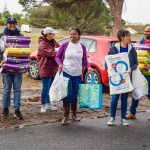 On the day we handed out boerewors rolls, a listener who wanted to remain anonymous volunteered to re-do the kitchen at the center, and a microwave, was also donated. Heart FM’s programming manager Denver Apollus built a TV and DVD stand – the center also received a brand new TV and DVD player from Vodacom. 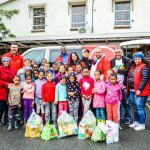 Principal at Vrolike Vinkies in Malmesbury Glenda was speechless when the donations came pouring in; she says the donations are going to allow them to do more with the children. Some of the kids have been rescued from abuse, while others come from surrounding neighbourhoods. The rest of the Heart FM team as well as Organisation Early Year Services painted the jungle gym in the playground at the centre. Principal of Vrolike Vinkies, Glenda Baadjies, joins us. Her mom was one of founding members of the school in 1987. She gave up another teaching opportunity with the department, as she felt that this school needs her more. Aden put out a challenge, wanting someone to replace this old kitchen, which has been around for 27 years. Take a look.